Autosport International touts itself as "the racing car show" and I suppose you could accept that. For die-hard F1 fans like ourselves, there are not enough exhibits about the premier motorsport that we love, but generally, the atmosphere is one of petrol head bliss. Imagine our surprise this year, then, to find ourselves walking through the booths, admiring the cogs, only to be presented with Michael Schumacher's Ferrari hanging upside down from the ceiling. You may think we have just upended a picture, but if you look closely, the tyres are strapped to the metal structure to keep the Ferrari from falling on anyone's head. There's also a reflection in the top left - a wibbly representation of the red devil - not to be confused with another car sitting on top of the original. 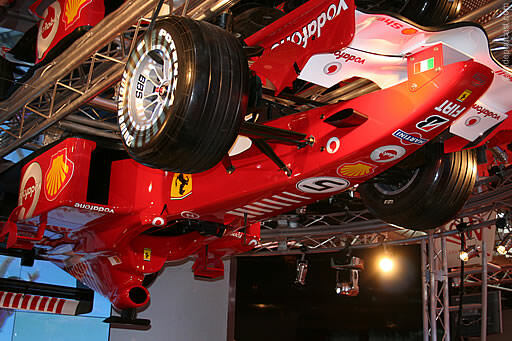 There didn't appear to be any reason for this bizarre display of F1 technology, and I know that we would have been much more interested to see the underside of the car, had it been suspended from the ceiling the correct way up. Either way, we were grateful to see a flash of F1 in amongst the Porsche's and the pretty girls, albeit an odd tribute to the prancing horse. We'd just finished traipsing round the wonderful Donington Collection, looking at all the old cars, helmets, and trophies. We'd filmed some stuff inside the museum, but wanted a nice introduction with me standing in front of the great tribute. 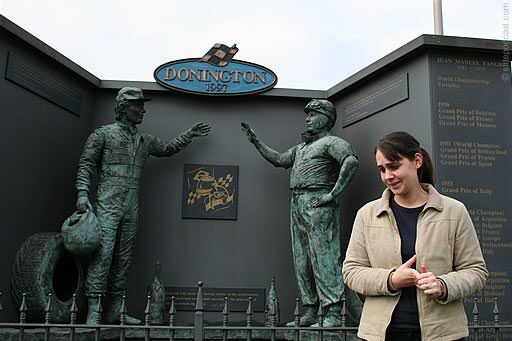 The statue depicts Ayrton Senna and Juan Manuel Fangio, and where better to film your first piece to video? This was my first attempt at presenting anything, and it was slightly stressful. Aside from being generally nervous, I was also incredibly conscious of the people walking behind us, in and out of the building. They looked at us as though we were crazy (especially the man with the decent video camera, laughing at our embarrassingly mediocre equipment). Look at the sheer desperation in my expression. I am trying to remember what it is I'm supposed to be saying, whilst at the same time wondering how I can run away and not be in the video without anyone noticing. Thankfully I didn't, because I went on to love being in front of the camera, and I'm always wanting to get some practice in. I'd quite like to go back and show that man our video camera now, just to show him that we are getting more professional all the time. GPlive was not only a new experience for us, but for everyone else as well. A brand new event, it went off very well, and there were plenty of good things to do and look at. There was room for improvement as well, but generally, we had a great time. One of the best things for us, though, was watching the film crew who were trying to capture everything. EPI TV were covering the event, and there were plenty of guys in black t-shirts running around hefting wires, equipment, and plenty of black tape. When we were waiting for the interview with Martin Brundle, we couldn't take our eyes off the crew setting up. Where to put the lights, were the microphones working, how would they get questions from the audience, was Martin even going to turn up? Fiddling with switches, raising volumes, and wielding that black tape, it was great fun. We learnt a lot, and then we got to hear from Brundle and Moss. What more could you ask for? I didn't get to go to Silverstone testing this year, and I won't let him forget it, but I heard many tales about the event. 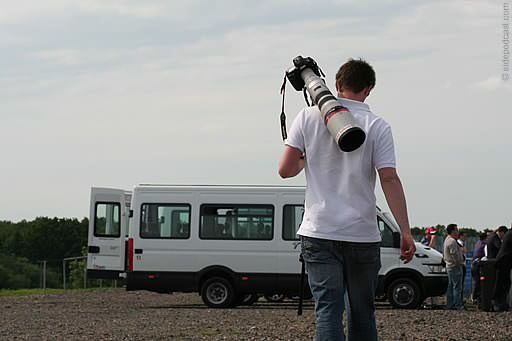 The most prevalent one though, was about all the other cameras and their enormous lenses. This picture serves as proof that size does matter! What it really shows is how lucky those professional photographers really are. They turn up in a minivan at a prime location, whereas we have to park amongst everyone else, scrabble through the crowds, sharpen your elbows, just to get a decent view. They just have to point and click their enormously expensive cameras, adjust their ridiculously long zooms and capture some brilliant shots. We struggle with changing between our close up and long range lenses, miss the perfect moments, and generally get rather stressed out by the whole experience. That's not to say we don't love it, it's really that we're incredibly jealous. Talking of being jealous, you see that little clump of business men by the white van? They're being ferried around on a tour by Toyota. Do you think they are really interested in F1 testing or do you think they are just there because their employer sponsors the team? We would appreciate that tour so much more! But hush, little green-eyed monster. 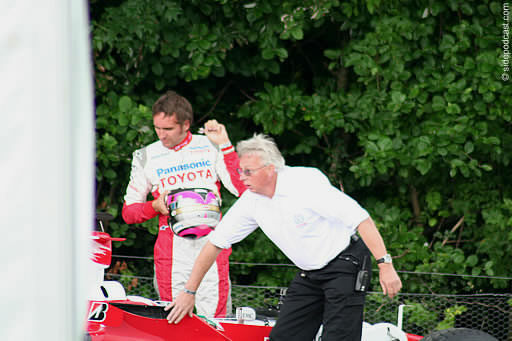 It's no secret that Goodwood, for me, was all about Franck Montagny. We saw him all over the place and my heart was truly stolen by the beautiful Frenchman. 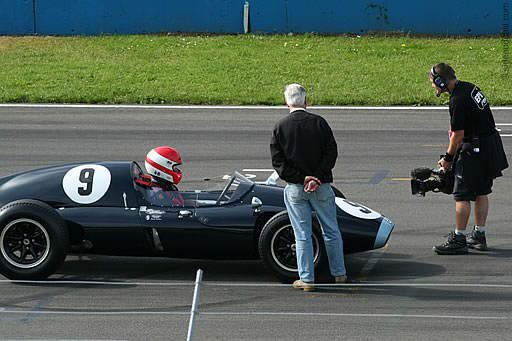 For those three days, I probably couldn't have told you who Jenson Button was. Anyway, what I'm not sure about is why I would have kept this picture. It's out of focus. There's some kind of pillar in the way to the left. There's an odd looking man with bad sunglasses, and his hand in a position that could be misconstrued. I do know why I've kept it though. Even though it's a bad photograph, and is actually one of many poorly taken (and hidden away) shots that we have, it sums up what Goodwood is all about. Drivers doing what they do best in an atmosphere that is not perfect but is one of love and respect for all things motor and all things speed. It may be a dodgy photo, it may be a dodgy pose (and let's not get started on the pink helmet), but for me, it is Goodwood personified. Picture the scene. It is the end of a long, outdoor weekend. We have enjoyed a marvellous race and are worn out, but want the experience of the apres-race. We spy a crowd by the exit and wait with them. A couple of mechanics and engineers walk past. A rumour goes up that we are waiting for Murray Walker next. I turn round to say something to the man and he is gone. I spy him by a different fence. He snaps the above picture. 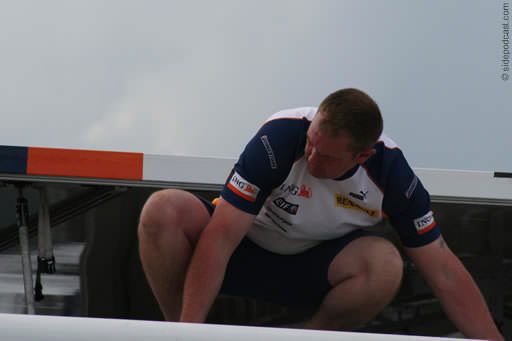 Why you would want a picture of a Renault mechanic dismantling the motorhome, I really don't know. He says it's something about getting the intricate details of the team's weekend, and I can believe that. Whether the intricate details are interesting or not, well, that's up to you to decide. It is nice to see the other side of the coin though. You get to see the glamour of the big screens, the grandstands and the cars (I'd say glamour of the grandstands, which might be pushing it...), but what goes on behind the scenes? Apparently, guys in shorts take bits of metal apart. Previous post Red Bull F1 meets YouTube?